Climbing roses combine the best of traits of lower growing roses--color, beautiful form and fragrance--with the space-saving qualities of a climbing plant. Technically a climbing rose is any rose with canes long enough to tie to a support. Many large shrub roses, like the English rose, 'Graham Thomas,' can also be used as short climbers. Compiling a "top ten" list of climbing roses is difficult, as there are many first rate plants on the market. However, the following ten climbers have won numerous awards and stood the test of time. They should be included on any rose grower's list of must haves. 'America' was introduced for the United States Bicentennial in 1976. A vigorous grower that can reach 15 feet in height, it is salmon-pink and fragrant. It was an All America Rose Selection in 1976. This French rose has the look of an heirloom, with fragrant pink petals that sometimes have a striking hint of pale green. 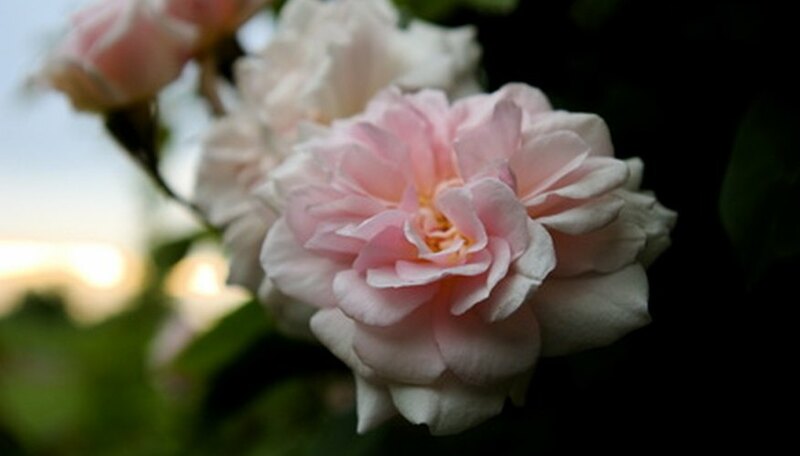 'Eden,' which is the climbing form of a shrub variety of the same name, was introduced in 1962, and has received awards at American Rose Society rose shows. Introduced in 1956, 'Golden Showers' has loose, yellow blossoms that age to ivory. It was an All America Rose Selection in 1957. This large-flowered climber is flashy, with red and white stripes and a loose, semi-double form. Bred in the United States, it was introduced in 1999. 'Hanabi' has won multiple awards, including the All America Rose Selection (1999) and the British Association of rose Breeders Breeders' Choice Award (2000). 'Joseph's Coat' is a color-changing rose, with golden-pink buds that open to pink flowers. The blossoms age to a deep rose. When the bush is in full bloom, it appears covered with flowers of many different shades. 'Joseph's Coat' is excellent for training on pillars. It won the French Bagatelle Medaille d'Or (Gold Medal) in 1964. Introduced in 1930, 'New Dawn' has large, pale pink flowers. It is a vigorous bloomer throughout the growing season. Long recognized as a classic rose, it was inducted into the World Federation of Rose Societies' Hall of Fame in 1997. Though not usually listed as a climber, 'Sally Holmes' is eminently suitable for training on a support, as it can grow as tall as 12 feet. The pointed ivory buds open to nearly white, five-petaled flowers with a sweet scent. Unlike the blooms of many climbers, 'Sally Holmes' flowers last a long time in a vase. The plant received the (German) Baden Baden Gold Medal in 1980. A true antique, 'Sombreuil', was introduced in France in 1850. It has a multitude of scented, white petals and dense, dark green foliage. The plant was awarded the American Rose Society's Dowager Rose Queen award in 1999. Cerise double blossoms with a wonderful raspberry-like scent distinguish this antique variety, introduced in 1868. The canes are almost thornless, which is a plus in small gardens. Like 'Sombreuil,' 'Zephirine Drouhin' received the American Rose Society's Dowager Rose Queen award . Beales, Peter. "Classic Roses." New York: Henry Holt and Company. 1985.